The RecyclerView widget is a popular option on the Android platform for efficiently displaying dynamic data collections. The data items feeding the RecyclerView may change as a result of user’s actions or with data fetched from the network. As the name indicates, RecyclerViews recycle the views that correspond to the items in the data sets. Couchbase Lite 2.0 as a data source for RecyclerViews in your Android application. In this tutorial, we will be using Couchbase Lite as a standalone, embedded data store within your mobile app. git (Optional) This is required if you would prefer to pull the source code from GitHub repo. Familiarity with the fundamentals of using Couchbase Lite on Android. If you need refresher, refer to our Getting Started with Android Java Guide. Familiarity with the basics of Android app development apps and with RecyclerViews. We will be working with a very simple "University Lister" app. It displays a list of "university" items in a Recyclerview with Couchbase Lite as the data source. Build and run the app in Android Studio. Tap on the "ADD UNIVERSITY" button. This will result in a new university item getting added to the RecyclerView. 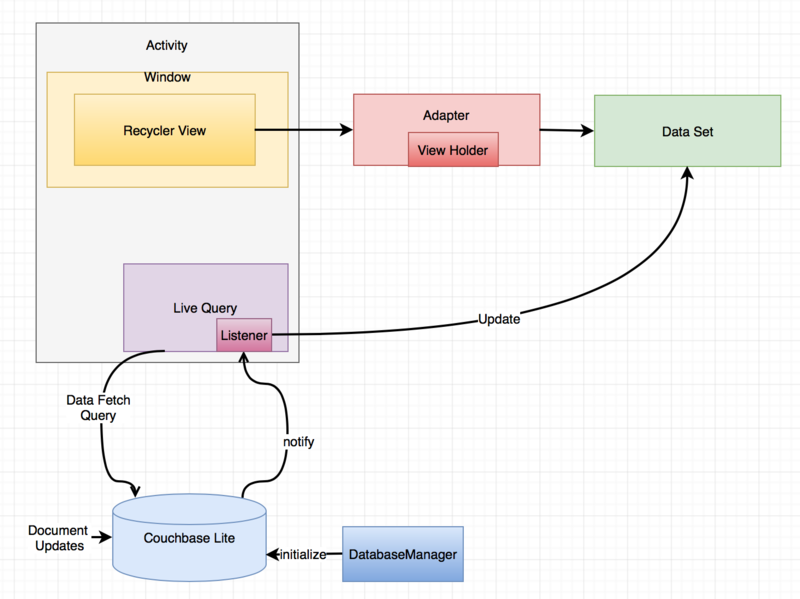 A typical design pattern for using Couchbase Lite as the data source for the RecyclerView in your app is shown below. This also corresponds to the way we have implemented it in the sample app. The RecyclerView is instantiated by the Activity and contains the Adapter . The Adapter is responsible for binding the data items to the view using the ViewHolder pattern. Couchbase Lite is the data source for the data items that is used for populating the views. The Database Manager which is a singleton class is used for initialization and management of Couchbase Lite. The Couchbase Lite Query API for interacting with the database. A Couchbase Lite Live Query allows an app to register for changes to the database that affect the results of the query using the addChangeListener call. The Activity uses the Couchbase Lite Live Query to query for data items in the database and a listener is registered to handle query data updates. Every time the database gets updated with data that affects the query results, the Activity is notified of the changes via the listener callback. After retrieving the data from the Couchbase Lite database, the Adapter is notified of the changes. The RecyclerView is then updated with the updated data set. NOTE: How the data gets into Couchbase Lite is not important in the context of this tutorial. In a real world app, the data in Couchbase Lite may be fetched from a remote server or may be updated as a result of the local user’s action. In our app, we manually insert a randomly created University document by clicking on the "ADD UNIVERSITY" button. Open the ListActivity.java file and locate the onCreate method. This is where all the initialization takes place. 3 The RecyclerView is configured with the UniversityListAdapter adapter and the appropriate Layout Manager. Open the DataFetcher.java file and locate the doInBackground() function During Activity Launch, the DataFetcher class loads the sample university data from a local file bundled with the app. The loading of data is done on a background thread using AsyncTask. 1 The sample data is loaded from the university-sample.txt file in the assets folder. The content is in JSON format. 2 Once the data is read, The JSON data is mapped to corresponding University POJO objects using the Jackson library. 3 ListActivity is then notified of the completion of data load via the IDataFetchResponse interface. Note: The sample data is not saved into the Couchbase Lite database at this point. It is in an in-memory data structure called sampleData in the ListActivity class. We will see how this sample data is used a little later in the tutorial. Open the ListActivity.java file and locate to the QueryForListOfUniversities() method. This Activity sets up a "Live Query" to fetch the list of universities from the Couchbase Lite database. Initially, it will be empty. 1 A Query is created ising the link:http://docs.couchbase.com/mobile/2.0/couchbase-lite-java/ [Query API] to fetch all documents from Couchbase Lite database. Typically you will use a where clause to filter the subset of documents to be fetched. But in our case, the database only holds the university documents so we just retrieve all of it. 2 A query change listener is registered to listen to all database changes that impact the query. This makes the query "live". As documents are added to the Couchbase Lite database, the activity will be asynchronously notified of the additions. In the Loading Sample Data section, we discussed how to load the sample university data into an in-memory sampleData List data. This was intended to simulate the loading of data from an external source, like a web service for instance or a local user’s action. Now, we discuss when and how that data is used. Open the ListActivity.java file and locate the fetchUniversityAndAddToDatabase() method. The fetchUniversityAndAddToDatabase() method is invoked when the user taps on the "ADD UNIVERSITY" button in the app. In this method, we insert a data item from the sample data into Couchbase Lite. // Save document to database. 3 The Document is inserted into the database. This insertion triggers the Query listener to be invoked.